As today is the first day of spring [ZOMG, how is it spring already / not complaining], I thought I’d share 2 tools I use every day for keeping organised and on top of the chaos. This isn’t a one-sided thing either. If you have tried and tested ways of staying organised day to day, I’d love to hear it. I am after all, dangerously excitable when it comes to being organised. The first tool in my ammunition – my agenda. I’ve been using an agenda every year since they started handing them out in high school. Whenever I have a deadline, I immediately write it in my agenda. If someone arranges a date, agenda. A birthday, anniversary, meeting or event? Agenda. Even though a lot of things have gone digital, I think I’ll always use an agenda and I find it pretty rewarding crossing an appointment off and meeting deadlines. Is that sad? Actually, don’t answer that. Oh! I nearly forgot – for events that you’re not sure of, I usually write them on a post-it and stick it to that day. If you also get hesitant about committing things to the agenda, do this until the event is more certain. I don’t wanna have to cross stuff out. 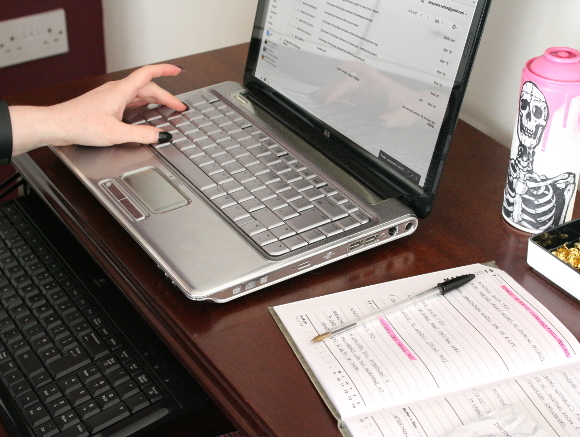 My second secret weapon – email organisation. The other week I saw someone’s inbox when I was out. Not being nosy, their screen was right there. But their inbox was FULL. OF. EMAILS. Hundreds of them. And I nearly held them and wept for them. It somewhat prompted the idea for me to write this blog post. My second tip to stay organised from day to say is to only keep to-do or reminder emails in your inbox. Everything else gets filed in a folder. Create a folder for everything [I have folders for Co-Bloggers, Projects + specific sub folders for each project, Queries, Subscriptions, Family, Website etc.]. Once I’m finished with an email, I file it in a folder. If I get an email involving something I need to complete, I keep it in my inbox until I’ve finished that task, then once I finish it I file it away. This way I know exactly what I have yet to complete. Okay, I hope that wasn’t too wordy or overly boring for you, but these tricks are things I’ve used every day for years now and I can’t picture myself not using them. Yes, even if a paper agenda is a bit old school these days. 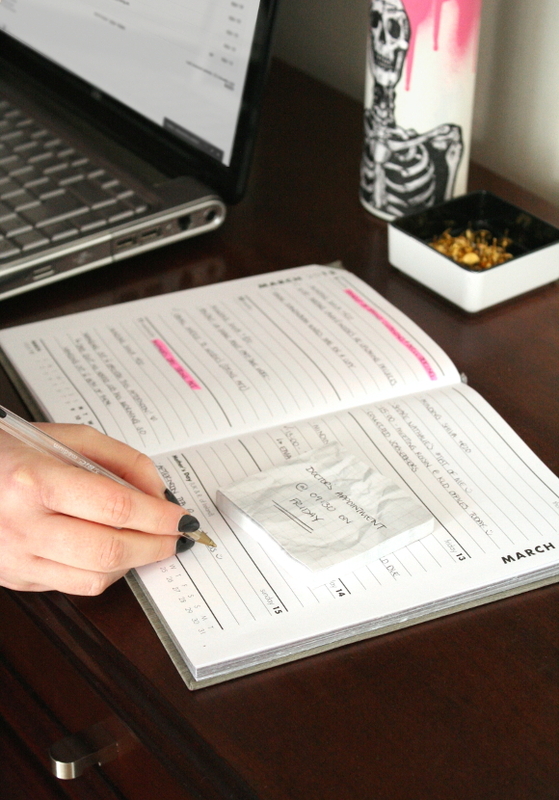 Do you have tried and tested ways of staying organised every day? I think you know this by now, but I’d really like to know. In the least creepy way possible. Jennifer – that's exactly it. I couldn't have said it better myself. I really do love filling the pages up with plans and ideas, and yes! I find it so relaxing. I enjoy sitting down and backdating details into my agenda too. p.s. I recently saw this video on the history of romanticism that so perfectly sums it up. I'm forever in a angst with technology. This is amazing! I've already started purging my inbox! I don't know why i haven't thought of organising it that way before. So good. I am with you ALL. THE. WAY with this. My diary (I don't call it an agenda) comes everywhere with me and I would be lost without it. I much prefer paper to digital. I also have a planner/calendar on the wall in the kitchen on which all of the family's appointments/birthdays/night's out etc go. That way we all know where we are. Well – the adults do. The kids can't read yet! I like your tips about the email – mine just gets so out of hand! I do have folders (there is an Alex folder, and a #DrunkInteriors folder!!) but still I find my inbox filling up. I think I need to maybe be a bit more ruthless with the unsubscribe button, and move other things to folders quicker. I guess it's building the habit of moving straight away unless there is a pending action. Thanks for the post – I always love organisational tips, as you know! #DrunkInteriors folder – I HAVE ONE TOO! Hahahaha, love it! And I love your tip on Exploring Minimalism about cutting out the subscription emails. They really are such an inbox plague.